“We wanted a signature piece for the 75th anniversary because the festival is all about making memories,” says Brian Hill, the festival’s executive director. “A Ferris wheel appeals to all ages. Seniors remember when they use to go on Ferris wheels as a regular thing. For younger couples, it’s a great date night piece. And for kids who have never ridden a Ferris wheel before, it’s an exciting thing to do.” Hill also thinks it’ll be a great way to see all the changes in the Midtown skyline over the last decade. With all the lights, it’ll be especially magical at night, he adds. Shooting the chutes at the Cotton States and International Exposition at Piedmont Park, 1895. As the Dogwood Festival is the third oldest fine arts festival in the country, it wouldn’t seem right to create a full Midway, Hill says. But the Ferris wheel will have one companion ride—a vintage 1965 carousel. 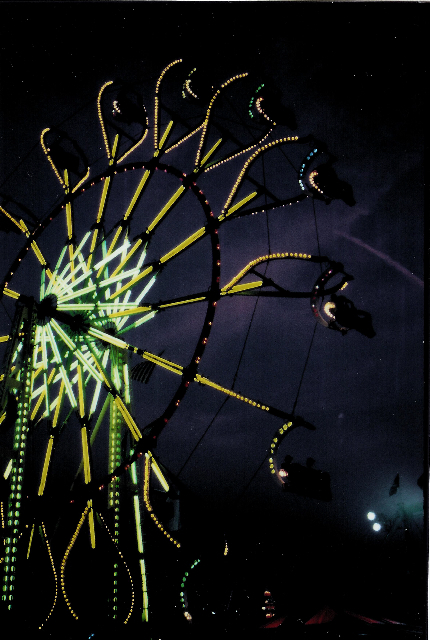 While the festival, founded to celebrate Atlanta’s best-known spring blooms, doesn’t have a history of rides, it’s interesting to remember that Piedmont Park was originally designed as a site for expositions which did feature carnival-style Midways and rides, including at least one Ferris wheel. 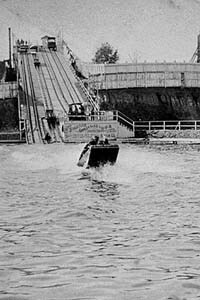 The largest and most ambitious of these, Cotton States and International Exposition of 1895, featured the Phoenix Wheel, and another highlight was “shooting the chutes,” an early water ride reminiscent of the Six Flags log flume, into Lake Clara Meer!